Automatic contact synchronization helps you integrate your e-commerce, CRM or CMS system with Newsletter2Go. Add powerful email marketing functionality to your platform to synchronize contact list effortlessly. 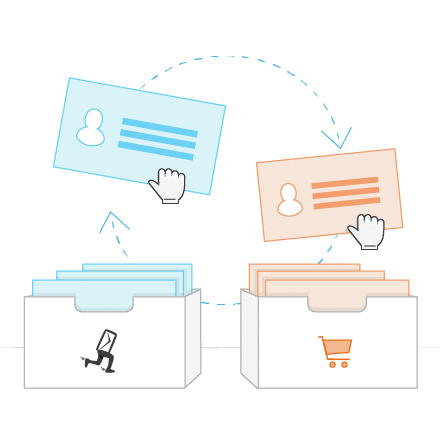 With our newsletter recipient synchronization feature, managing contacts is easier than ever. You save precious time and don’t need to worry about manual contact import. Manual address list export is also a thing of the past. Once the feature is set up, expect an automatic contact list update in accordance with the contact lists in your original system. Synchronize contact list daily or with one click of a button. If a newsletter contact has unsubscribed via the unsubscribe link in your newsletter, this information is noted within the Newsletter2Go system and they will no longer receive newsletters. Our software makes sure you always stay on the right side of the law. The automatic contact synchronization is already available for the following systems: JTL Shop, Magento, plentymarkets. In order to use the feature, you will need to order a personalized premium template with webshop integration. We take care of designing the template exactly to your specifications, and can even use your corporate design and logos if you want. Order a premium template in your Newsletter2Go account or send an email to our sales team. See what some of our newsletter template examples. Please note: Our software is particularly useful for ecommerce shop owners. Not only can you synchronize contacts with ease and send newsletters, but also you can track campaign results in detail. Get a glimpse into important figures, such as open, click-through and bounce rates. Your data is analyzed in real-time to help you get a better insight of your marketing accomplishments. Conversion tracking enables you to calculate your ROI and see the revenue you’ve made. A/B tests, which allow you to test up 9 variants, are a useful tool that helps you optimize your newsletters. Test three subject lines, sender and content variants per newsletter. Best performing variants will be automatically sent out by our software so that you can focus on other activities. All of our features are very intuitive just like the newsletter recipient synchronization feature. Learn more how our newsletter software helps achieve great results in ecommerce.